This morning on Facebook my blog buddy Existere posted one of her wife’s babywearing videos. After I was done watching, Lily grabbed one of her babies and started trying to shove it in the front of her shirt. 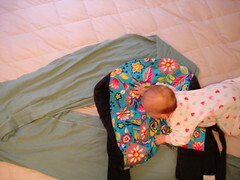 Once she had succeeded she requested that I put the other baby in the back of her shirt. 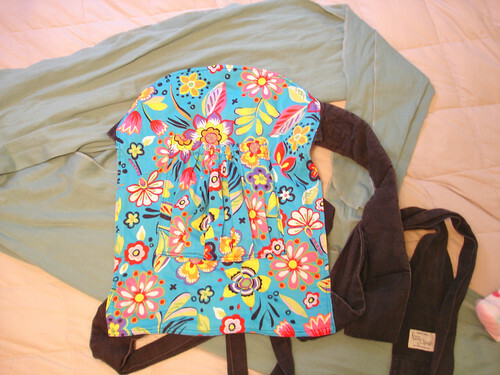 Rather than stretch the heck out of her shirt I grabbed a bathing suit cover I had just given to Lily and used it like a wrap. She was so happy to have both of her babies secured (mostly) to her body just like Existere and TMD. I of course had to take pictures. 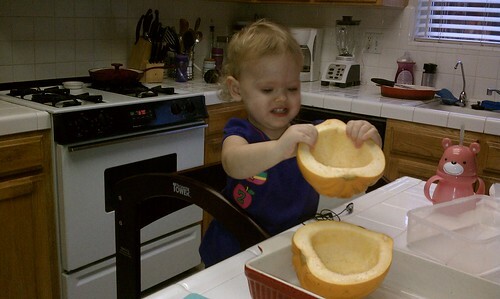 Lily loves Acorn Squash, so much so she didn’t want to wait for it to cook. 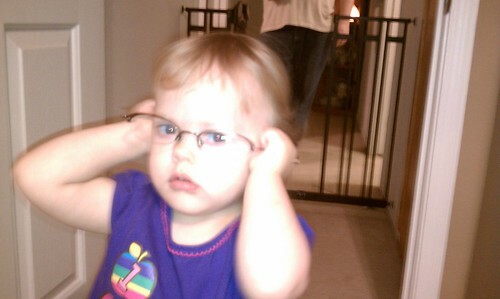 I don’t normally let her touch my glasses, but she looked so cute I had to take her pictures before took them away. I have wanted to wear my baby for as long as I could remember and when I got pregnant with Lily my desire just increased. I read everything I could find on the internet and daydreamed about what I’d like most. I thought I’d start simply so I bought a pouch sling from Target and quickly returned it. I was pregnant so my belly got in the way but it just felt wrong. After Lily was born I ordered a Moby wrap. I used it a few times but she didn’t seem to like it much. We are a picky lot. 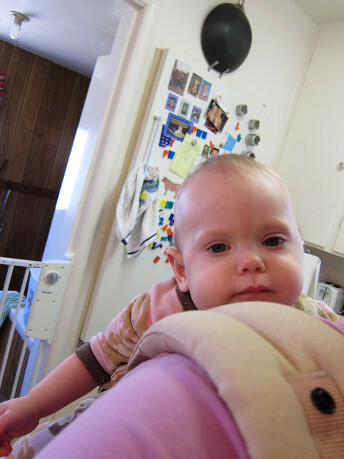 A few months after Lily was born I stopped at the baby consignment shop and found a great deal on a Kozy carrier Mei Tai. I can't believe this was just over a year ago. Lily is SO tiny. We used it every once in a while but not all the time so I kept my eye out because I knew there had to be something better. 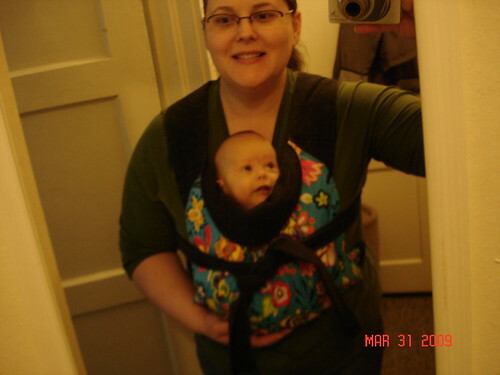 Then a few months ago I found a store that was having a sale on Ergobaby carriers. After a couple of days of trying to decide if the price was worth it and convincing Waldo that it was I ordered a nice tan Ergo and I was not disappointed with it. Within two minutes of it getting delivered I had Lily strapped to my chest and I was off to take pictures. The Ergo is so much quicker to put on then tying the straps of the mei tai that I really started using it almost everyday and once I got the back carry down I do use it everyday. In fact most days I use the Ergo more then once. I strap Lil to my back and do some cleaning and laundry and it works out so great so that I can make dinner again or at least get dinner started and then Waldo can finish it. 🙂 The Ergo is totally worth the price and then some. While looking around at the babywearer.com for trade/sale forum I found a screaming deal on a ringsling. I have always wanted one so I just couldn’t pass it up. I am so glad I got it. It is so quick and easy to just grab and toss on. It is perfect for shopping and wearing around the house when Lily wants to be held and I’m not doing something like cleaning where I need her a little more out of the way. I use my ringsling all the time. I’m still getting the hang of it though and need to learn some different carries. Babywearing is a perfect for someone like me who has a baby that needs to be close all the time. I can satisfy her need to be held and have my hands free to do things that I need to get done. 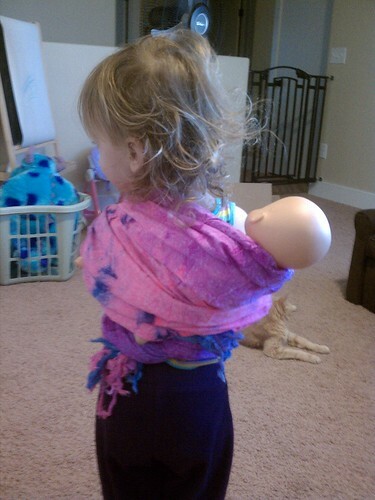 Babywearing is very safe when done properly and is such a sweet way to hold your baby close. 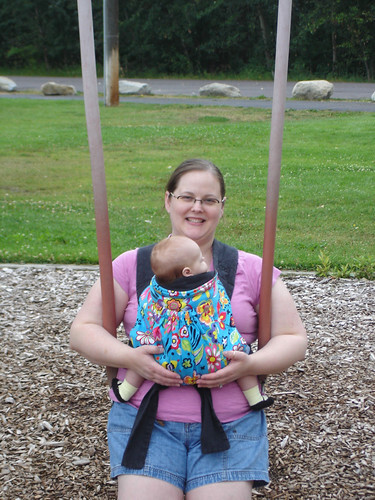 There is a lot of information on the internet about babywearing, my new favorite blog is by my friend Alison. 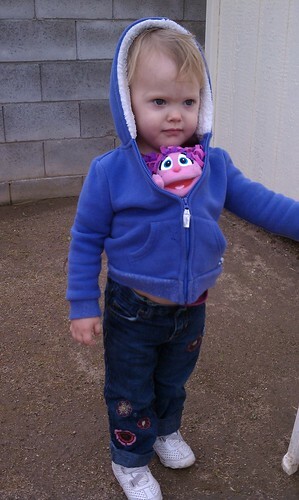 She is my hero and tandem wears her cutie pie twins. Waldo was skeptical about babywearing when I first talked to him about the idea. He didn’t know if it was really safe or going to be effective with Lily. He has changed his tune and now makes comments all the time about me putting Lily on so we can do this or that or something else. It really makes me feel like a true babywearer and I couldn’t be more proud. 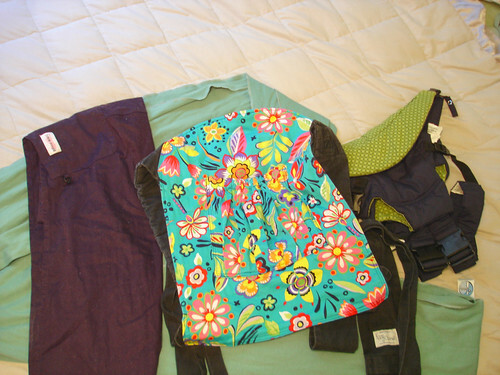 The lovely and talented Steph from Adventures in Babywearing has invited us to show our stash. 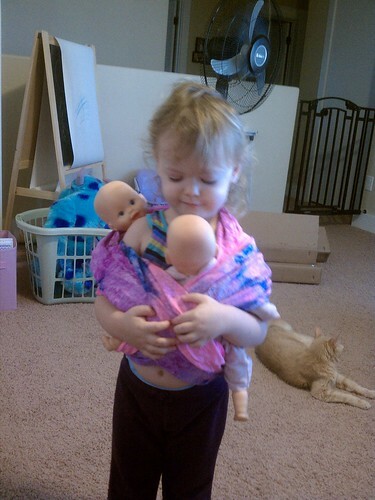 Here are all of my baby carriers. 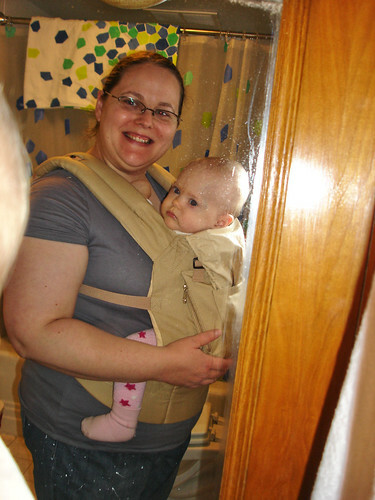 I have a Moby wrap, a Kozy Carrier mei tai, an Infantino carrier and a Peanut Shell sling. I was wondering how other people stash their stash? I haven’t found a good convenient place to put them in the new house yet. 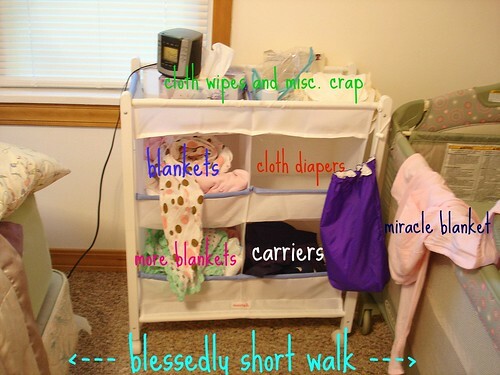 For now they are in my diaper/blanket cart, but now that I’ve washed most of my cloth diapers this cart needs to get reorganized.